There are few proof coins in the world more brilliant and in demand than the Proof Gold American Eagle. The Gold American Eagle Coin is the nation’s official gold bullion product, and the proof version is aimed at collectors who value sharp designs and brilliant finishes. Right now, the 1995-W 1 oz Proof Gold American Eagle is available on Silver.com in perfect condition. Consists of an actual weight of one troy ounce of gold. “W” mint mark from the West Point Mint. Coins ship in protective plastic slabs courtesy of the PCGS. Proof Gold American Eagles were first released in 1986 alongside the bullion version of the coin. The 1 oz Proof Gold American Eagle is the longest running weight in the proof version, with fractional weight coins introduced in 1987 and 1988. Proof coinage is not a modern invention, but its popularity among collectors is a modern concept. Originally, mints struck proof coins only to test the quality of the dies and accuracy of the coining press, as well as to produce small batches for use in national archives. Today, proof coins are popular with collectors because they possess sharper rims and design features, including deeply-mirrored background fields. On the obverse side of all Gold American Eagles is the image of Lady Liberty created by Augustus Saint-Gaudens. In 1905, President Theodore Roosevelt hand-picked Saint-Gaudens to revive the design of American gold coins. His depiction of Lady Liberty was his first design and greatest achievement. The reverse side features an image unique to the Gold American Eagle series. Sculptor Miley Busiek’s depiction of a family of nesting bald eagles was created specifically for this series in 1986, and appears on the reverse of all coins in the series. 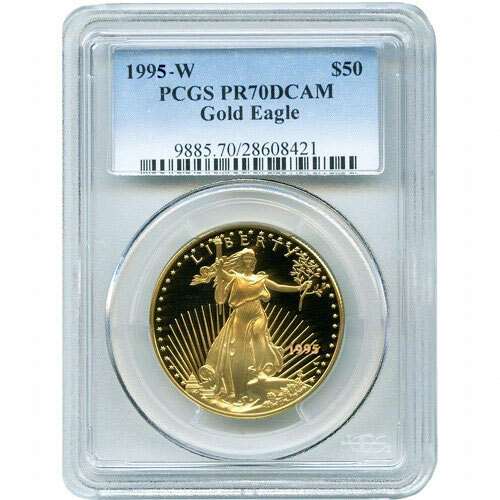 Each of the 1995-W 1 oz Proof Gold American Eagles in this listing has a PR70 grade from the PCGS. A perfect proof coin has its full, original luster, and no detracting flaws. Deep-cameo coins have frosted designs that appear to float above deeply-mirrored background fields. If you have questions, you can reach a Silver.com associate at 888-989-7223, online via our live web chat, or by sending us an email. 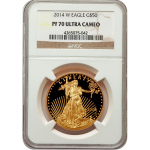 To view similar products, be sure to check out our full selection of Proof Gold American Eagles.